For lots of people, reducing waste is one of their New Year’s Resolutions, and there is an increasing push towards reusable products to save both the environment and money. 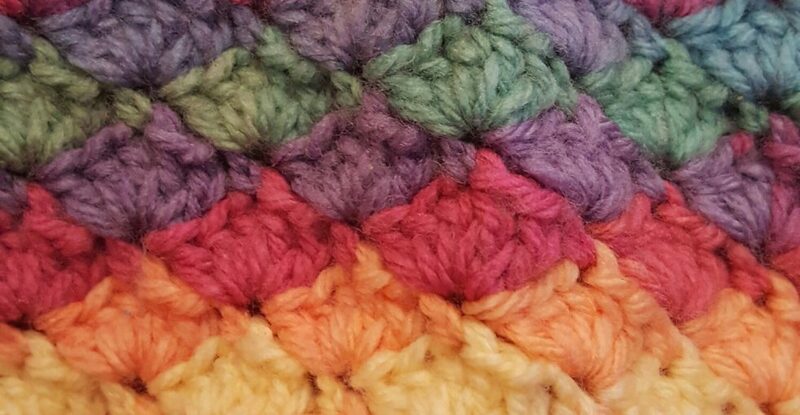 This pattern for scrubbies to use as an alternative to cotton wool is the result of me experimenting with hook sizes, number of stitches and a couple of yarn types. For mine, I used a 3.5mm hook and aran weight cotton yarn (mine was Women’s Institute Home Cotton from Hobbycraft). I wanted the stitches to be close together and leave minimal holes (to prevent eye make up remover leaking through too easily) without the fabric being too stiff. It does soften with washing/use too so don’t worry if it does seem a little tough to begin with (maybe don’t use them for eye make up removal on their first use!). It’s worth experimenting with hook sizes to get the effect you desire though. The finished cotton pads are about 7.5cm across. For reference, I have used UK crochet terminology. I’ll crack on with the pattern now I’ve got that out of the way! Round 1 Make a magic ring, chain 1 and make 12 treble crochets into the ring. Pull it to close, and slip stitch to the top of the first treble. Round 3 Chain 1, then make a puff stitch into the same stitch. To make a puff stitch: yarn over, hook through the stitch, yarn over and pull through (3 loops on the hook), yarn over, hook through the stitch, yarn over and pull through again (5 loops on the hook), yarn over, hook through the stitch, yarn over and pull through again (7 loops on the hook), yarn over and pull through all 7 loops-this takes a little bit of wiggling with a cotton yarn! Then make a chain to secure the stitch. The photo below shows all of those stages. Round 4 Chain 1, make 1 double crochet into each stitch around. Do not slip stitch to the first stitch this time. To complete the circle neatly, instead of slip stitching and pulling through, cut off the yarn and pull the loop at the end of the final stitch until the end comes out of the stitch. It won’t all fall apart! Then thread your needle and take the yarn under the two strands of the first stitch of the round and back down between the two strands of the final stitch of the round. This creates a duplicate stitch rather than tying off and leaving a knot. (I will add a better photo to show this stage shortly i.e. when I get time to crochet in the daytime and can take a decent photo!) Darn in the end and darn in the starting tail from the magic ring. Use the hook to pull the loop until the end comes through the stitch. There you have it, one quick and easy reusable face scrubbie! Enjoy the pattern-these would make a lovely Mother’s Day gift. Let me know how you get on, I’m @craftandothercrazyplans on Instagram if you want to share a photo. You are welcome to use this pattern to make items to sell, but please use your own photos and credit me as the pattern writer. These would make great pads for nursing mums! Now that is a fab idea! I promise once you get going you won’t stop! I wish I could crochet! Great job. I keep meaning to try these, I really must get on it!